Edward Taylor was the first to realize the commercial potential of Eagle Harbor, building a short timber pier in the bay in 1844 from which to supply the growing number of miners in the area. A rocky ledge with only eight feet of water above it spread across the harbor entry, and represented a barrier to vessels of deep draft. However, the copper boom saw an increasing number of vessels visiting the dock, and Taylor began to lobby for federal funding for improving the entry into the harbor. At the time, responsibility for the nation’s navigational aids at the time fell under Stephen Pleasonton, the Fifth Auditor of the Treasury. Pleasonton’s experience was purely in the area of fiscal administration, and having no background in maritime matters, his administration was characterized by slow reaction to maritime need and the choice of "least cost" alternatives. 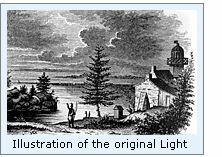 However, convinced of the need to establish a Light at Eagle Harbor, Pleasonton convinced Congress to pass an appropriation of $4,000 for the construction of a Light to guide mariners into Eagle Harbor on March 3, 1849. Construction began on the western point of Eagle Harbor in 1850, and while we have yet to find exact specifications for the structure, we do know that the structure took the form of a rubble stone keeper’s dwelling with a square white-painted wooden tower integrated into one end of the roof. The tower was capped with an octagonal wooden lantern with multiple glass panes, and outfitted with an array of Lewis lamps with reflectors. With the lamps standing 21 feet above the dwelling’s foundation, the building’s location on high ground placed the lamps at a focal plane of 47 feet above lake level. John Griswold was appointed as the station’s first Keeper, and while he first appears in payroll records for the station on October 25, 1850, subsequent reports indicate that the new station was not exhibited until 1851. Thus, it is likely that construction was not completed before winter’s grip spread across Superior, and exhibition of the light was thus delayed until the opening of the 1851 navigation season. Through the early 1850's a cry arose in the maritime community, voicing concern over Pleasonton's tight-fisted administration. A study commissioned by Congress concurred with the concern, and recommended the establishment of a nine-member Board to oversee the administration of aids to navigation. Staffed with Scientists, Navy officers and Engineers from the Army Corps of Engineers, the Lighthouse Board was established in 1852, and Pleasonton relieved from any further involvement with aids to navigation. One of the Board's first orders of priority was the upgrading of illumination systems from the dim and poorly performing Lewis Lamps to the far more efficient and powerful French Fresnel lenses. To this end, the Lewis lamps were removed from the lantern at Eagle Harbor in 1857, and replaced with a Fourth Order Fresnel lens, exhibiting a characteristic fixed white light varied by a white flash every two minutes. With the establishment of a new light station at Eagle River in 1859, John Griswold accepted a transfer to the new station, and with his departure John Alexander took over the station on February 1, 1859. By 1865, a total of four new Keepers had worked at the station, with two of them removed from office, one resigning, and one passing away after only seven months at the station. Civil War veteran Peter C Bird was appointed as Keeper on August 12, 1865. Bird had suffered a severe leg injury at the battle of Gettysburg, and appears to have been a relatively common practice for partially disabled veterans to be rewarded for their service with appointment to keeper positions. A short seventeen years after its construction, an 1868 inspection of the station found the building to be in critically deteriorating condition. Finding the rubble stone to be "laid together in the rudest manner" and its lantern "of the oldest pattern having small panes of glass, and heavy sash bars which obstruct the light," the Lighthouse Board recommended an appropriation of $14,000 to allow a complete rebuilding of the station. Congress responding with the requested appropriation on July 15, 1870, and later that year contracts were awarded for supplying the building materials and iron work needed for the construction of the new station. With the delivery of a work crew and materials at Eagle Harbor on the opening of the 1871 navigation season, construction of the new station began in earnest. Rather than creating a unique set of plans for the new station, Eleventh District Engineer Brevet Brigadier General Orlando M. Poe resurrected a plan which had been previously used on Chambers Island in 1867 and at Eagle Bluff in 1868. After blasting out a hole for the cellar, the masons crafted a two-story dwelling red brick dwelling, 29-foot by 25-foot in plan, with an integrated 44-foot tall tower oriented diagonally into its northeastern corner. The exterior of the first and second stories of the tower were approximately ten feet square with buttressed corners, while the tower's upper portion consisted of a ten-foot octagon. The tower was double-walled, with a circular inner wall approximately four inches thick and eight feet in diameter. This cylindrical inner wall supported a cast iron spiral staircase which wound from the oil storage room in the cellar to a hatch in the lantern floor. Since these spiral stairs also served as the only means of moving between floors in the dwelling, steel doors provided access to landings on both the first and second floors to prevent the spread of any fire in either the dwelling or tower. The first floor of the dwelling contained a parlor, kitchen and two bedrooms, and the second floor two bedrooms and a closet. A 12-foot by 20-foot brick addition on the rear of the building served as a wood storage shed. Atop the tower, the gallery floor was sheathed with copper, and surrounded by an iron hand-railing to provide security to keepers when cleaning the plate glass panes in the decagonal lantern. As construction neared completion, the District Lampist arrived, moved the Fourth Order Fresnel lens from the old tower into the new lantern, and carefully readjusted the clockwork mechanism to ensure that the light’s characteristic was maintained. After Peter Bird moved his belongings into the new station, the old structure was demolished to eliminate confusion to mariners on the lake. Since the opening of the new lock at Sault Ste Marie in 1855, there had been a dramatic increase in both the number and size of vessels plying Superior’s waters. With the rocky ledge at the harbor entry precluding entry to all vessels but those of the shallowest draft, Federal funding had been approved for opening a channel through the ledge in 1866. Under the direction of an Army Corps of Engineers officer, locally hired workers blasted a channel 130 feet long and 14 feet deep through the rock ledge, and a pair of timber cribs floated onto the ice, where they were sunk to mark each side of the cut. While the new Eagle Harbor Light served as both an excellent coast light and guide to the harbor entrance, it did nothing to guide vessels through the barrow channel through the ledge. With the work well underway in 1873, the Engineer in charge of the project recommended the erection of a pair of range lights to lead mariners through the narrow channel, and heeding the Engineer’s recommendation, the Lighthouse Board recommended an appropriation of $8,000 for the construction of range lights at Eagle Harbor in its 1873 annual report. Peter Bird’s war injury appears to have worsened over his nine years as Keeper, as he was removed from office on November 17, 1874, and superceded by his brother George, who was appointed as Acting Keeper until he could prove himself. Congress provided funding for establishing the range lights on March 3, 1875. After a year of service, George Bird was promoted to full Keeper status on November 17, 1876, but resigned the position the following July. Stephen Cocking, an Cornishman who had come to work the Copper mines and ended up serving eleven years as Keeper of the Gull Rock Light was appointed as Acting Keeper to replace Bird, and promoted to full keeper status two months later on September 21. Unfortunately, Cocking passed away at the age of 54 on November 21, 1889, and was replaced by Henry Pierce who was newly appointed to the position. With visibility in the area of Eagle Harbor frequently reduced by storms and snow late in the navigation season, the Lighthouse Board recommended that an appropriation of $5,000 be made for the establishment of a fog signal station and Eagle Harbor in its 1889 report. 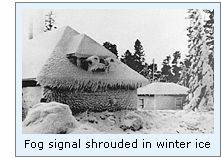 While Congress passed a Bill approving the establishment of the fog signal on February 15, 1893, it continually ignored the Board’s repeated pleas for funding for six years, until the requested funds were finally approved on March 2, 1895. With the funding finally available, Eleventh District Engineer Major Milton B. Adams acted quickly, approving plans and specifications for the station and awarding contracts for furnishing both construction materials and the fog signals equipment within a few weeks of the appropriation. Since a light station with a steam fog signal was considered to be more than a single keeper could handle, Lighthouse Board policy called for such stations to be manned by at least two keepers. Thus, with the impending completion of the new fog signal, a search was initiated for a First Assistant Keeper for the station. Construction on the fog signal began that September with the pouring of concrete footings 100 feet to the west of the lighthouse. Atop these footings, timber frame walls were erected and sheathed with planking on the exterior and smooth iron sheets on the interior. The cavity between the inner and outer walls was then filled with mixed sawdust and lime to serve as an insulating and fireproofing layer. The entire exterior of the structure was then covered with a layer of corrugate iron sheeting, and given a coat of dark brown paint. After pouring of a concrete floor, twin steam engines and water supply tanks were installed, and the boilers vented through a pair of iron stacks protruding from each side of the roof. A pair of Crosby 10-inch automatic fog whistles were installed at the opposite end of the roof and plumbed to the boilers. The entire system was then fired-up and tested at 80-pounds pressure, and the whistles adjusted to emit a repeated 44-second cycle of a 2-second blast, 12 seconds of silence, a second blast of 6-seconds and a second period of 24 seconds of silence. William Rohrig was appointed to the position of Assistant, and reported for duty at Eagle Harbor on November 11. With the dwelling only sized for a single keeper and his family, Rohrig was forced to find accommodations in the village, and moved into his new quarters in time for the fog signal’s official activation on November 30, 1895. As the nineteenth century drew to a close, traffic channels in the Lake changed as the twin Ports of Duluth and Superior became the preeminent ports for the shipment of iron and grain to the bustling industrial centers on the lower lakes. 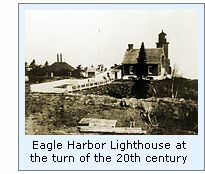 As a result, the Eagle Harbor Light increased in importance as coast light to serve as a guide to east and west-bound traffic, and in 1897 the Lighthouse Board considered the installation of a Second Order Fresnel lens at the station in order to increase the station’s visible range, however this change was never undertaken. Showing signs of deterioration, the twin iron smokestacks on the fog signal building were replaced in 1905 by a single brick chimney standing 3 feet square at the base and 40 feet in height, with both boiler exhausts plumbed into the single chimney. Three years later, a crew arrived at the station to undertake a number of welcome improvements to the dwelling. A frame woodshed was erected, and the original brink woodshed at the rear of the dwelling converted into a kitchen, adding considerably to the living space within. Central steam heating was also added through the installation of a boiler in the station’s cellar. 1907 was also likely a memorable year for Keeper John Nolen and First Assistant Claude Burrows, as they toiled to shoveled 43 tons of coal into the fog signal boilers in order to keep the whistles screaming their warning across the lake a station record 544 hours. With continuing improvements in illuminating technology, the lamp within the Fourth Order lens was replaced with an incandescent oil vapor lamp on June 20, 1913. As a result of this modification the output of the fixed light was increased from 520 to 1,600 candlepower, and that of the white flash increased from 5,600 to 42,000 candlepower. 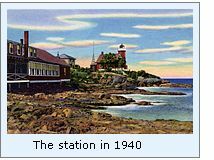 Eagle Harbor was also one of the earliest locations on the Great Lakes to have a US Navy radio compass transmitter established adjacent to the Life Saving station in 1918. Two buildings were erected by the Navy to house the equipment and operating crew assigned to the station. With the automation of the Copper Harbor Light in 1919, that light exhibited an occulting white light. Being located only sixteen miles to the east of Eagle Harbor, a number of mariners complained that the characteristics of the two lights were too similar, and requested that one of the lights be modified to eliminate any confusion. 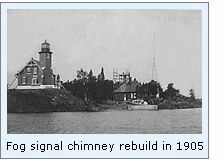 To this end, the characteristic of the Eagle Harbor light was again modified on May 15, 1924 through the installation of a red segment on the bull’s eyes, causing the light to show fixed white varied by a bright red flash every two minutes. That year the decision was also made to add a Second Assistant at the lighthouse, with William J Miller appointed to the position that April. With no changes having been made in the accommodations on the station property, both Miller and First Assistant Hans Christensen were still forced to make their own living arrangements in the village. Mariners began complaining that the faded red brick of the Eagle Harbor tower was difficult to see against gray skies during daylight hours, and to help the tower serve as a more effective day mark, the tower sides facing the lake were given a coat of bright white paint on April 13, 1925. A work crew arrived at the station in 1828 and removed the thirty-year old boilers and steam whistles and replaced them with a pair of Type F diaphone fog signals operated by a diesel powered compressor. The following year a radiobeacon transmitter was set up in the fog signal building and wired to an antenna to the west of the building. Just as each station had its own characteristic light and fog signal patterns, so each radiobeacon emitted a repeated Morse code signal unique to that station. The Eagle Harbor radiobeacon characteristic consisted of repeated groups of one dot and 3 dashes. By receiving the signals from two such transmitters simultaneously, and knowing the exact location of each signal, captains out on the lake could accurately triangulate their position. With the establishment of this radiobeacon, the Navy compass station across the bay was rendered obsolete, and the station was thus closed down. With the two buildings at the abandoned radio compass station no longer serving any purpose, the decision was made to move one of the buildings across the bay to the light station where it could be used as dwellings for the First and Second Assistant Keepers. To this end, the lighthouse tender ASPEN arrived in the Harbor with a work crew and a barge in 1932. While part of the work crew prepared a new foundation for the structure on at the light station, the remainder of the crew lifted the structure onto the barge to be towed across the bay. On arrival at the light station, the dwelling was carefully lifted ashore and hoisted into position on the awaiting foundation. In an attempt to reduce operating costs, the Coast Guard removed the Fresnel lens from the lantern in 1962, and installed a pair of DCB-224 aero beacons in its place. With one of the beacons displaying a white light and the other red, the characteristic was again changed from fixed white with red flashes to alternating periods of red and white light. Equipped with automated bulb changers, the way was now paved for the station’s automation, which finally came to the station in 1982, when seaman Jerry McKinney left the station on January 8, the last in a series of 36 men who served at the station ensuring the way was marked for mariners making their way across the lake. With automation, responsibility for maintenance at the station fell to the crew of the Portage Entry Coast Guard station, who made regular but infrequent visits to the station to ensure that the light was operating properly. In 1982, the Keweenaw County Historical Society obtained temporary stewardship of the station buildings, and the Society set about restoring the dwelling and furnishing as it would have appeared at the dawn of the twentieth century. In 1999 Congress transferred permanent ownership of the station to the Society, and thus survival of this historic structure is assured for future generations to enjoy. 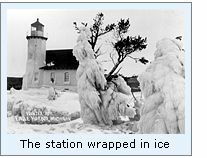 Click here to see a complete listing of all Eagle Harbor Light keepers compiled by Phyllis L. Tag of Great Lakes Lighthouse Research. The Eagle Harbor Light sits on a rocky outcropping from the Keweenaw, and is seen from across the bay, sitting amongst the rocks which the station was designed to guard. The buildings now function as a museum operated by the Keweenaw County Historical Society. The lighthouse itself is completely refurbished and furnished, and features mannequins set-up as if they are living in the building. The fog signal building has been converted into a maritime history museum, and has some excellent historical information about the numerous ships that have run-aground in the area, and information about the United States Lighthouse Service, including keeper’s uniform, logs and USLHS china used by the keepers. There are also many interesting period photographs showing the difficulty of conditions at the station during the winter months. Take M26 into the village of Eagle Harbor. As you enter town, turn left up the gravel road into the lighthouse property at the point where M26 takes a sharp turn to the right. If approaching from the North on M26, the view at the left above can be seen across the bay just North of the village.